'Noisy Nativity' - for children who can't keep quiet - is the Christmas story told with gusto! A very simple nativity musical for young children, with plenty for all to do. There are lots of actions to the songs, and lots of noise to make with voices and percussion, all of which keeps children very engaged. Great fun, and bound to be a parent-pleaser! The show opens with children playing percussion and clapping so loudly that their teachers come to quieten them down. ‘Why are you making all that noise?’ they ask. ‘Because Christmas is exciting!’ the children reply. Connor and Chloe are under the impression that Christmas is all about presents, but the teachers point them in the direction of the Nativity – and so begins a lively retelling of the story of Jesus’ birth. The script is very versatile, suiting almost any size of cast. There are just a handful of main parts, which can easily be shared out to suit larger groups – and if you have nursery age children, the part of the teachers could even be played by adults. Rachel Crowe - Family outreach worker, Somerset. 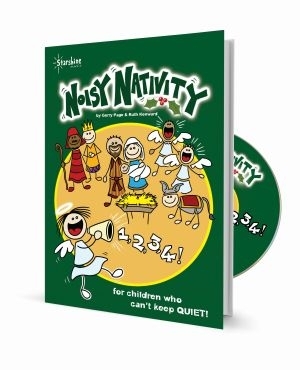 We used Noisy Nativity for two toddler groups with approximately 25 -30 children at each session. We used it as a no rehearsal, no practice, walkthrough version of the nativity story. If you're used to doing a nativity with under 5s you know it's chaos no matter how much you practice so we took the stress out of it. Words on the screen, and lovely children's choir singing all the lyrics on the CD provided. We had one narrator who read the lines, and got parents and children voicing back some of the obvious bits! It worked like a dream. Simple and effective story AND the songs are repetitive and easy to pick up. We had a big box of instruments for the children to play and they bashed and crashed away through the songs but were surprisingly interested in the story bits and really well engaged. What a fantastic resource to have available. Thanks Starshine!